The following is a reference / historical listing of the 70-millimeter presentations of “Grand Prix” in North America. These were the best cinemas in which to experience the film. The presentations cited in this work were “hard ticket” roadshow engagements (except where noted otherwise) and were special, long-running, showcase presentations in major cities prior to the film being exhibited as a general release, and they featured advanced admission pricing, reserved seating, an overture/intermission/entr’acte/exit music, and an average of only ten scheduled screenings per week. Souvenir program booklet were sold, as well. Out of the hundreds of films released during 1966, “Grand Prix” was among only eight that were given deluxe roadshow treatment and among only seven to be released with 70mm prints. The MGM presentation was directed by John Frankenheimer and starred James Garner, Eva Marie Saint, Yves Montand, and Toshiro Mifune. 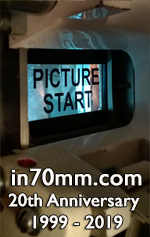 The film’s 70mm prints featured full-frame imagery from 65mm photography (Super Panavision 70) and discrete six-channel stereophonic sound. The majority of the presentations during the first several months of release were booked in Cinerama-branded cinemas, included a “Cinerama” notation on the print and in advertising, and were projected onto large, deeply-curved screens. The presentations held in non-Cinerama-branded cinemas would have had the “Cinerama” notations removed and/or replaced with a notation of a different presentation type. The world premiere of “Grand Prix” was held at the Warner in New York on December 21st, 1966. The 2007 Linwood Dunn screening was the public premiere of a newly-struck print made during a home-video restoration and remastering project. (This new print was initially screened privately at the Academy’s Linwood Dunn Theater on May 23rd, 2006.) The presentation was sourced from an unsounded 70mm print interlocked with a printmaster. The print was screened during the “Sound, Camera, Action!” series, in conjunction with the program “The Sound behind the Image,” a series of films highlighting sound achievement in a selection of influential and immensely popular films. This information has been principally referenced from film industry trade publications and regional newspaper promotion, with thanks to Al Alvarez, Jim Barg, Kirk Besse, Raymond Caple, Nick DiMaggio, Fritz Herzog, Bill Hogan, William Hooper, Bill Huelbig, Mark Huffstetler, Bill Kretzel, Mark Lensenmayer, Stan Malone, Robert Morrow, Gabriel Neeb, Jim Perry, Robert Throop, Joel Weide, Vince Young, and an extra special thank-you to all of the librarians who helped with this project.